Got my Wedding outfit made with chamee and Palak and absolutely loved it. I placed my order online and the team was very helpful in arranging video calls and share the design with me. Overall great experience.!! Found them online while searching for my reception lehenga. Very gorgeous and lavishly made lehenga. I customized Tara outfit in lavender color. Totally loved it and the detailed work on outfit is really outstanding. I just explained them what I want and the output I got is much more beautiful than I expected.The staff is very sweet ,polite and understanding.got immediate response when ever I asked them for any details. Loads of love to chamme and palak group. You guys made my big day with overloading compliments Ã°ÂÂÂÃ°ÂÂÂ Thank you so much and I will keep shopping with u guys. I got to know about th designers from instagram and they are truely great. Their designs are very different from what we see everywhere these days and they are beautiful!!! I am super happy with my outfits and their client treatment as well. Found them on instagram and ordered online. Absolutely loved my outfit, good quality, detailing was fantastic. Nothing over or under done. Hey Chamee & Palak, Thank you once again for a beautiful outfit. The best part of their designs is that they are perfect mix of mordern and Indian styles . They have always been very prompt in answering my questions and giving me my outfit on time . I am look forward to make more outfits from you. Purchased my engagement and wedding reception outfit from Chamee and Palak. Superb collection and very comfortable wear for the bride. Also the color combinations offered are unique as well as royal and give the bridal feel. I selected my reception gown from instagram pictures. I made some changes with the neckline and was extremely satisfied with the end product. I would definitely recommend Chamee and Palak. Their attention to detail is marvelous. Very professional !I confirmed the lehnga by seeing it on Instagram over the phone!Was a little skeptical as to how it would turn out and whether I will get on time as I had about a month’s time and as the occasion was a day before Diwali!But not only I received it on time it was very beautiful!Much more than I expected !Beautifully embroidered and imacuately finished!Very very satisfied! Extremely happy and proud to be associated with a such a beautiful and elegant brand, totally worth every penny we spend, such intricate work every outfit is a crafted customised masterpiece only made for you!! Love you both Hetal and Palak !! Keep rocking!! Chamee and Palak are a fabulous team ! I got a very chic and dainty lehenga for my sisters engagement. I live in the US and was checking Instagram to find an amazing outfit when I came across Chamee and Palak?s Instagram page ! They were super quick to reply and I was able to get my gorgeous piece within 6 weeks of ordering ! The best part was, despite me being extremely naive about taking my measurements, they were able to use good judgement to deliver an outfit that fit me so well :) The detailing on the lehenga with beads, pearls, embroidery gave a characteristic combination of a style and simplicity ! Impressed beyond words ! Would love to order more ! Chamee& palak are the most talented designer sisters i know in mumbai. They have an amazing sense of style in what they create. They made a few of my outfits for my wedding & they were gorgeous, perfectly stitched & delivered on time.The best part about them is they understand the need of their clients, adds style to whatever they create for you. It has always been a pleasure working with them. I ordered 3 outfits for a family wedding from Chamee & Palak - all customized based on pictures on Facebook and Instagram. The team was easy to work with and confirmed all designs based on my input. They were responsive to my requests for updates and delivery was on time. I am very impressed with the overall quality and would certainly order from Chamee & Palak again. Beautiful outfits! I am basically from gujarat went to mumbai, chamee n palak for my wedding trousseau. They suggested me the type of fabric n the style as per my body type. 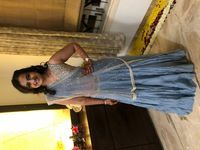 They customised a sari gown in my size and couriered it to me at my place in gujarat. Most importantly I received the outfit on time as per the pre decided dates of delivery. The outfit fitted me so perfectly!! Thanks to chamee n palak for the lovely outfit!! I went to the Chamee Palak store when I visited Mumbai in November to purchase a Sangeet outfit for my May wedding in United States. I ordered a beautiful customized lehenga. They were able to take one blouse from one outfit and combine it with a skirt design from another piece that I liked. In addition, they custom-dyed the skirt fabric and dupatta to the exact color that I wanted! When I tried my lehenga on after receiving it, the fit was perfect. I received many compliments at my Sangeet on how beautiful the lehenga was. I would definitely recommend Chamee and Palak to all brides! Thank you! I got my wedding lehanga from chamee and palak and it was beautiful.They have a very classy collection with gud detailings.luv ur work. Thanks for making my big day beautiful. 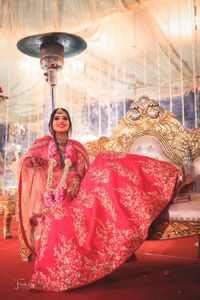 Like every other bride, I wanted my bridal lehenga to be extremely special. It was when I came across the designs by Chamee and Palak I knew that if I'm wearing a designer custom-made piece, it has to be Chamee and Palak! I visited their store with prior appointment and got 3 outfits done by them specifically for Mehendi, The Bridal Lehenga, and my Reception Lehenga. The designers are very easy-going and had me try on a few designs to get a glimpse of my taste. Accordingly, they suggested the designs and customized them in such a way that I had three stunning outfits within my budget! They have a simple, straight-forward process for measurement and the order was processed on time. The entire team is really helpful and patiently answered any queries that I had during my order was being processed. My experience with Chamee and Palak was extremely good and every time I see my bridal outfits I thank them from the bottom of my heart! Chamee and Palak, your outfits just made my day as perfect as it could be! Ha ha true we dint even meet! you looked very classy on your special day. Glad it all worked out well. I bought my wedding ceremony outfit from Chamee and Palak and I'm so pleased with the results! I live in Toronto and was on a short trip in Mumbai, when I purchased the outfit. At the boutique, they helped me mix and match pieces to fit my vision, style and budget. Their boutique was so beautiful and so were all of their sample outfits. I was sad to leave with just one outfit from them! Since I had made the purchase 1.5 years in advance of my wedding (and was going to pick it up after 10 months of my order), I made a request for some changes to be made to the outfit several months after I had placed my order (due to changing trends on Instagram and such). I communicated all the changes I wanted through whatsapp/phone call and they executed them all so well and accurately, without causing me any undue. They even suggested what would work or wouldn't work well. It's so refreshing to see that they put so much effort into making sure that their brides are happy and satisfied! I'm so excited to wear my outfit this summer! Chamee and Palak helped me pick the perfect garba/sangeet outfit for me. As an NRI, I was only in Mumbai for a limited time so they really made me comfortable about getting my fittings and final product in a short amount of time. They made sure my outfit fit perfectly and even added stitching to my dupatta (for an extra cost). Everyone loved the color of my outfit and the intricate bead work on it. They made the entire process stress free. Thank you again! I recommend you to anybody looking for pretty and memorable wedding outfits. They are the best. They make the process of selecting your bridal outfit extremely easy , stress free and enjoyable. One place shop to select your trousseau and wedding outfits. I purchased my mehendi lehenga from this store after having done some research on instagram. I was a bride from London and was very overwhelmed with how much choice there is in Mumbai. As soon as I stepped foot into this really cute store I instantly knew what I wanted. The team are absolutely fantastic. As I was only in Mumbai for 1 week, they made sure I had a blouse trial and the fit was perfect. My outfit got shipped over to me and came in approximately 6 weeks. It fitted and looked amazing!!! Thanks again! Chamee & Palak are absolutely wonderful. 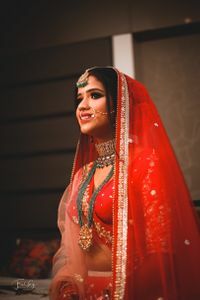 I am a future bride and I picked out my lengha this past summer at their flagship store in Mumbai. The ambiance and customer service was absolutely excellent. They had a great variety of lenghas and unique customized pieces. Within minutes I was able to select both my wedding and reception lengha. They also shipped my lenghas to the US in a timely manner and quick to respond via WhatsApp. I highly recommend any future bride to definitely check out their collection for some stress free wedding shopping! Thank you so much guys, can?t wait to wear my lenghas! I got married in USA and I ordered my wedding outfit over email and chats. I was in love with it the moment i saw it. It was perfect and so beautiful. I couldn?t have imagined it better than this. They were so quick and understanding. The outfit was delivered to me in less than 3 weeks which was amazing. They know how to make their clients happy and satisfied. Love love love the ivory lehenga. Ordered a lehenga for sister's engagement and absolutely loved it! The fit was perfect and it looked amazing! Definitely would order from them again! Hey Deepa, it was a pleasure to serve you. Thank you for your feedback. Look forward to seeing you soon. I got my Bridal outfits from Chamee & Palak- really good collection of bridal wear as well as for trousseau. I have seen at many places the bridal collection but chamee and palak clothes seem to be outstanding especially when u have to fit in your budget good clothes. The designs are really pretty. I have visited them at many exhibhitions like bridal asia. I am looking forward to pick up my outfit from chamee and palak for my wedding. I have always done horribly when it came to selecting or purchasing Indian outfits, but thanks to my dear cousin for introducing me to Chamee and Palak and saving me from a seriously embarrassing and regrettable situation. Chamee & Palak have a wide range of unique and gorgeous designs. They also have a fabulous collection and colours that can be mixed and matched. They were very professional, helpful, responsive and made my whole bridal shopping experience smooth and hassle-free. My lehengas were customized according to my preferences and budget. They even gave their honest suggestions on what would look amazing on me (which I really appreciated) and shipped the outfits within the promised time frame. I looked and felt my best! Both of my outfits looked absolutely stunning! I seriously can?t thank these lovely ladies enough! Big thumbs up! I loved thier designs, I got my sangeet and reception outfit from them. They make really elegant, versatile and timeless pieces and I love that you can mix and match and reuse the outfits. The team is also really good, very helpful, even though I was managing my wedding from abroad I didn't have to worry about my outfits, everything was done on time and the last adjustments we're done quickly. Definitely recommend thier designs for any occasion. Thank you for your kind words! It was a pleasure dressing you up! And your wedding photos are truly amazing!! I got a chamee palak Ayesha lehenga with beautiful pearl work in English blue and sage green contrast dupatta for my sangeet function. The fitting was perfect. Both chamee and palak were very helpful and very friendly too. They were very professional and I highly recommend them to all the brides to be. I had been eyeing the designs of Chamee & Palak before I came to India to wedding shop. They were the first store I came to for bridal outfits. As soon as I tried on my bridal piece, I knew I didn't want to leave without getting it. It has been an easy and smooth process getting my outfits customized and shipped. Their work is very professional and they are very trust worthy designers. I had my outfits shipped to me and they look just like I wanted. I highly recommend them not just for bridal and party attire! Have been a fan of chamee and Palak's work since a while. They have beautiful and elegant piece with the perfect blend of colours. They help you pick up the right piece for My wedding and it felt amazing wearing it! I bought ALL of my wedding outfits from chamee and palak. They are hands down the best if you are looking for unique designs and affordability. They are very professional to work with as well. Hassle free luxurious designer lehengas I was able to coordinate from the US. In addition both of my sisters wore outfits from them and ALL of us received the most compliments on their outfits. Check them out!!! Chamee & Palak have a nice collection at affordable prices. Palak is a very straight-forward and honest person, a rare yet very pleasant quality for a businessman. She understands that every bride is different and accommodates their needs extremely well. In the beginning I was not sure of buying my wedding lehenga without having seen it in real but I took a leap of faith and she really did a great job. My mother too bought her outfit here and she made it ready in about a week, which I thought was impossible. Thank you so much, Palak! Customer service was uninviting and cold both in store and after I had placed my order. The assistants were actually fighting amongst themselves. The designers were not any better with their lack of customer interacting skills. On top of that, my outfit was completely ruined with one of the worst fitted outfits I have ever tried on. When it's meant to flatter you on your big day, it made me look 10 years older. I was absolutely gutted and speechless and had to resort to making my own saree as an alternative just days before the wedding. Not to mention the 50% deposit I had also lost. In hindsight, I should stuck to my gut instincts and not have placed my order here given the poor service! good stuff.. good for the fomal and informal occasions..
Chamee & Palak were an absolute delight to work with. Coming for the US, they knew the timeframe I was operating under and they worked with me to get all my outfits to me in time. Also, the outfits were exactly (and even better) then the way I pictured them! They are very responsive over phone, email, text and I would highly recommend them to anyone wanting to look beautiful for their wedding/special events/any occasion. The entire journey of deciding what to wear on d big day of your life was made so easy by chamee and Palak ... And moreover the final outfit turned out to be exactly as explained by them .... My wish was to wear yellow colour outfit and they gave me the perfect yellow shade which matched nicely with the wedding theme .. Thank you ... Their team is also super courteous and helpful ..
Chamee and Palak created my ceremony outfit and were amazing to work with. As an American bride not able to travel to India, I picked out my outfit as soon as I saw it posted online and worked with Palak via email to customize it. I was thrilled with the outfit and so happy that they were able to work with me online so I could get an outfit that I truly loved. My mom also purchased an anarkali that perfectly suited her. Chamee and Palak evoke the peppiness of the bride on her wedding day! Their collection is vibrant and it makes your face look just like a freshly blossomed flower.Their lehnga add elegance and evoke femininity in the true sense- a perfect combination of western and indian designs intricately done.. details make the duo stand out! Without doubt chamee and palak are the best as they not only dress you up but also your soul!! Chamee and Palak create beautiful and unique designs that are of such good quality. Each piece is lovingly created and their ability to customise makes them very versatile. I ended up getting my Mehendi, Wedding and Reception lehengas, as well as another lehenga for my first wedding anniversary from C&P. I would highly recommend them anyone, especially Brides!